Whether you are raising a vase to celebrate a birthday, a new job or any other occasion, here's the one to send. So bright, so beautiful, so colorful ? men and women alike will appreciate your thoughtfulness. 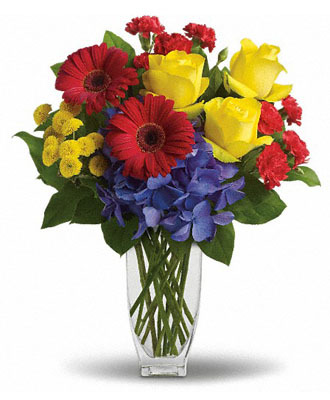 Brilliant blue hydrangea, yellow roses, red gerberas and miniature carnations, yellow button spray chrysanthemums are delivered in a vase. Here's to celebrating! Style of vase may vary.